Sony: PlayStation in the Future Will Be "a Service"
Sony's Fergal Gara says the company sees PlayStation "as a brand, not just as a box." What's the first thing that comes to mind when you think of PlayStation? Is it a game? A franchise? Or do you think of one of the various gaming consoles that's born the PlayStation name since the brand first launched in the 1990s? If you imagined a console you probably wouldn't be alone. That said, Sony is intent on changing that and expanding how people view the PlayStation brand. "We want to make more PlayStation experiences available on more devices," said Sony's Fergal Gara in a recent interview. In turn, the company is looking "to interact with the gamer in more ways, more flexible ways, and through more touch points in their daily lives." What this could potentially mean for the future is PlayStation hardware taking more of a backseat to PlayStation the service. "Whether you take PlayStation Vita TV, or the Gaikai cloud gaming technology, there clearly is a strategy here to bring more PlayStation experiences here to more people in the ways they want it," said Gara. "We're more about a brand and an ecosystem than we are about a box." Consumers can perhaps see hints of this vision in the streaming-centric Vita TV and Sony's plans for its Gaikai cloud service, which include the implementation of a stream-able PS3 library for PS4 and Vita in lieu of physical backwards compatibility. PlayStation's future, in turn, may lie outside of consoles altogether. 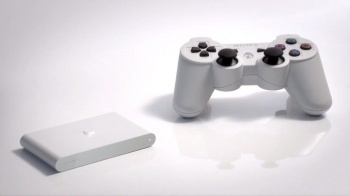 "We see PlayStation as a brand, not just as a box. Going out to 2013 and probably more appropriately 2014, 15, 16, 17 you'll see start to see PlayStation 4 as a brand and a service, as a set of services, a set of experiences" Experiences that will eventually take place on both "Sony devices and non-Sony devices."